Google has recently announced its controversial plan to merge all user data collected across its websites into one profile, which would then be used to target users with advertising and services and to further alter Google search results. User data from Google products – including Gmail, Youtube, Google+, Google Maps, and even Android mobile – will be collated and treated as a single set of data to be used for various targeted services and revenue-generating schemes. The changes take place on March 1st, and users will be unable to opt out of the changes. Google can store cookies on people’s computers to see which Web sites they visit or use its popular maps program to estimate their location. It can collect information about users when they activate an Android mobile phone, sign into their accounts online or enter search terms. For the first time, this data will be collated across its services into one user profile . Twitter, Facebook and Myspace have launched a tool called Don’t Be Evil – which is Google’s motto – that claims to neutralise any attempt by the search engine to skew results towards its Google+ service. Mat Honan from Gizmodo wrote: “It means that things you could do in relative anonymity today, will be explicitly associated with your name, your face, your phone number. An interested TED talk on Google is posted below. In it, Eli Pariser speaks about how Google is literally changing the way we view and use the internet, and not necessarily for the better. Today Wikileaks is set to release around 1,100 documents, brochures and manuals for products and technology sold by companies relating to systems for surveillance and interception of telecommunications. What is being revealed is an industry centred on surveillance, spying and intelligence interception that is worth around $5 billion a year. “Since the attacks of 9/11, I have watched with increasing dismay as more powers, money and resources have been pumped into the international intelligence community to combat the nebulous ‘war on terror’. As a result, civil liberties have been eroded in our own countries, and countless innocent people have been killed, maimed and displaced across the Middle East. Coming from an MI5 intelligence officer, that is worrying stuff. The Bureau of Investigative Journalism, in collaboration with Wikileaks and Privacy International, gained access document trove of 160 companies that sell surveillance technology to governments around the world. “The surveillance systems that we discuss in our seminars are available all around the world. Do some countries use them to suppress certain political statements? Yes, probably. But it’s not my job to sort out who are the good and bad countries. That’s not our business, we’re not politicians. However, commenting on such technology, Lucas stated: “This technology is absolutely vital for civilization. You can’t have a situation where bad guys can communicate and you bar interception.” – Yet Lucas seems adamant that it is not his ‘job’ to sort out who the bad guys are. The rise in electronic communications, from social networking to Skype, from text messages to emails, and an increase in the accessibility of such technology means that it is increasingly easier for governments and corporations to intercept and store communications data. This year’s ISS conference, hosted in Dubai, saw around 1,300 attendees from all corners of the world. However, Lucas said that it was Middle Eastern governments that were the most avid buyers of such software and equipment. Listening in on Libya: Communication Breakdown. A guide to Libya’s surveillance network. 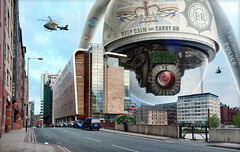 “The last decade has also been a boom time for companies providing high-tech surveillance capabilities. One aspect of this in the UK – the endemic CCTV coverage – is notorious. Local councils have invested in mobile CCTV smart spy cars, while cameras that bark orders to you on the street have been trialled in Middlesbrough. “Drones are increasingly used for aerial surveillance – and the potential for militarisation of these tools is clear. There is much more to be said about this matter, and the Wikileaks surveillance leak will provide much more information, hopefully sparking debate and discourse in the mainstream media. With the latest revelations of phone hacking and surveillance by tabloid newspapers, the British public may find such emerging information regarding the unaccountable, lawless surveillance industry distasteful. Two hacker groups, Anonymous and Team Poison, have released a joint statement on Youtube saying that they have joined forces to steal money from the banks and give to charities. “Operation Robin Hood is going to return the money to those who have been cheated by our system and most importantly to those hurt by our banks. Operation Robin Hood will take credit cards and donate to the 99 per cent, as well as various charities around the globe,” the duo said in a YouTube video statement. The collaboration between the two groups, which they have dubbed Poisanon, seems to rely on the idea of stealing personal data of credit card holders and using it to distribute it to the poor rather than using it for their own ends. The group believes that the banks will be forced to reimburse the damages, meaning that they will be the ones losing out. “We are going to make the banks deliver your money back to you with a smile on their faces and hate in their heart,” the group stated. Anonymous has been in the news recently for targeting Lt. John Pike, the officer behind the notorious pepper-spray attack on students at UC Davis. The ‘hacktivist’ group released targeted Pike, releasing his personal details online including his phone number and address. Team Poison have said that it carried out the hacking of a UN server and stealing logins and passwords of the international organisation’s employees. Both hacker groups have taken credit for several high-profile attacks on computer networks in the past. The underground group – responsible for the attacks on MasterCard, Visa, PayPal, Amazon and, allegedly, Sony – posted the public message as a response to NATO’s report, issued last month, which warned about the rise in politically-motivated cyberattacks and singled out Anonymous as the most well-known and sophisticated of the so-called ‘hacktavist’ groups. Anonymous continued by seemingly berating NATO for acting as if the organisation were some kind of cyber-terrorist organisation, or were somehow acting for their own agenda and not for the good of the masses: “We do not wish to threaten anybody’s way of life. We do not wish to dictate anything to anybody. We do not wish to terrorize any nation. “We merely wish to remove power from vested interests and return it to the people – who, in a democracy, it should never have been taken from in the first place,” the statement continued. The statement concludes with the warning: “Do not make the mistake of challenging Anonymous. Do not make the mistake of believing you can behead a headless snake. If you slice off one head of Hydra, ten more heads will grow in its place. If you cut down one Anon, ten more will join us purely out of anger at your trampling of dissent. I shall post the full response below. It is well worth a read, and it will be interesting to see whether NATO responds with a statement in return, or whether they ignore it. Time will tell, but it is clear that we are entering an age where, truly, “action in cyberspace will form part of the future battlefield” – for good or for evil. Greetings, members of NATO. We are Anonymous. In a recent publication, you have singled out Anonymous as a threat to “government and the people”. You have also alleged that secrecy is a ‘necessary evil’ and that transparency is npt always the right way forward. Anonymous would like to remind you that the government and the people are, contrary to the supposed foundations of “democracy”, distinct entities with often conflicting goals and desires. It is Anonymous‘ position that when there is a conflict of interest between the government and the people, it is the people’s will which must take priority. The only threat transparency poses to government is to threaten government’s ability to act in a manner which the people would disagree with, without having to face democratic consequences and accountability for such behaviour. Your own report cites a perfect example of this, the Anonymous attack on HBGary. Whether HBGary were acting in the cause of security or military gain is irrelevant – their actions were illegal and morally reprehensible. Anonymous does not accept that the government and/or the military has the right to be above the law and to use the phoney cliche of “national security” to justify illegal and deceptive activities. If the government must break the rules, they must also be willing to accept the democratic consequences of this at the ballot box.We do not accept the current status quo whereby a government can tell one story to the people and another in private. Dishonesty and secrecy totally undermine the concept of self rule. How can the people judge for whom to vote unless they are fully aware of what policies said politicians are actually pursuing? When a government is elected, it is said to “represent” the nation it governs. This essentially means that the actions of a government are not the actions of the people in government, but are actions taken on behalf of every citizen in that country. It is unacceptable to have a situation in which the people are, in many cases, totally and utterly unaware of what is being said and done on their behalf – behind closed doors. Anonymous and WikiLeaks are distinct entities. The actions of Anonymous were not aided or even requested by WikiLeaks. However, Anonymous and WikiLeaks do share one common attribute: They are no threat to any organization – unless that organization is doing something wrong and attempting to get away with it. We do not wish to threaten anybody’s way of life. We do not wish to dictate anything to anybody. We do not wish to terrorize any nation. We merely wish to remove power from vested interests and return it to the people – who, in a democracy, it should never have been taken from in the first place. The government makes the law. This does not give them the right to break it. If the government was doing nothing underhand or illegal, there would be nothing “embarassing” about Wikileaks revelations, nor would there have been any scandal emanating from HBGary. The resulting scandals were not a result of Anonymous‘ or Wikileaks’ revelations, they were the result of the CONTENT of those revelations. And responsibility for that content can be laid solely at the doorstep of policymakers who, like any corrupt entity, naively believed that they were above the law and that they would not be caught. A lot of government and corporate comment has been dedicated to “how we can avoid a similar leak in the future”. Such advice ranges from better security, to lower levels of clearance, from harsher penalties for whistleblowers, to censorship of the press. Our message is simple: Do not lie to the people and you won’t have to worry about your lies being exposed. Do not make corrupt deals and you won’t have to worry about your corruption being laid bare. Do not break the rules and you won’t have to worry about getting in trouble for it. Do not attempt to repair your two faces by concealing one of them. Instead, try having only one face – an honest, open and democratic one. You know you do not fear us because we are a threat to society. You fear us because we are a threat to the established hierarchy. Anonymous has proven over the last several years that a hierarchy is not necessary in order to achieve great progress – perhaps what you truly fear in us, is the realization of your own irrelevance in an age which has outgrown its reliance on you. Your true terror is not in a collective of activists, but in the fact that you and everything you stand for have, by the changing tides and the advancement of technology, are now surplus to requirements. 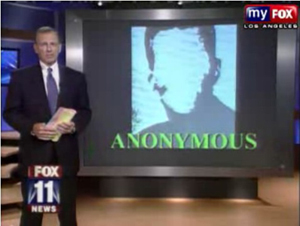 Finally, do not make the mistake of challenging Anonymous. Do not make the mistake of believing you can behead a headless snake. If you slice off one head of Hydra, ten more heads will grow in its place. If you cut down one Anon, ten more will join us purely out of anger at your trampling of dissent. Your only chance of defeating the movement which binds all of us is to accept it. This is no longer your world. It is our world – the people’s world. The Metropolitan Police have bought a security programme which can track suspects and their associates in the digital world, prompting a backlash from civil liberties groups and privacy campaigners, the Guardian reports. The Met, Britain’s largest police force, has its hands on Geotime, a security programme used by the US military. It can collate digital data and can be used to generate a three-dimensional graphic, showing an individual’s movements and communications with other people. It can collect the information from social networking sites, satellite navigation equipment, mobile phones, IP logs, and even financial transactions. Given the contention with the Met’s policing of the recent demonstrations, it is natural that there would be an outcry against such a purchase. It is emerging that the Met has been keeping tabs on “domestic extremists” – ordinary citizens who attend peaceful demonstrations or affiliate with activist groups. A recent example has been that of John Catt, an 86 year old man, who has had his presence at peaceful protests and demos logged in secret by police units over four years. He is currently attempting legal action against the police. He has no criminal record, yet has been systematically stalked by police units. There has also been an outcry against the infiltration of green activist groups by undercover police of late. Civil rights and privacy campaigners and lawyers are expressing concern at how the software could potentially be used to monitor innocent parties, in breach of data protection legislation. As their current track record is not immaculate, these concerns are potentially very valid. The Met has confirmed that Geotime has been paid for, yet has declined to give a figure. Several possible uses for the software are being assessed, yet there has been no comment on whether the software might be used during investigations into public order offences. In a controversial move that will primarily benefit US exporters, genetically modified (GM) crops will be allowed to enter the UK without the need for regulatory clearance for the first time under plans expected to be approved this week. Currently, imported animal feed containing GM feed has to be authorised by European regulators, but the UK is set to back EU plans to permit the importing of feed containing traces of unauthorised GM crops. This move would be a victory for the pro-GM lobby and would greatly benefit US exporters, however environmental groups are likely to be alarmed at these proposals. Eve Mitchell, food policy advisor at Food and Water Europe (a campaign group), says: “This is a solution without a problem, and the price could be very high indeed when unknown genetically modified organisms are let loose in the food chain. Meanwhile in an unrelated yet similarly alarming move, hundreds of herbal products will be banned in Britain from 1 May in accordance with an EU-wide ban on herbal medicinal products. 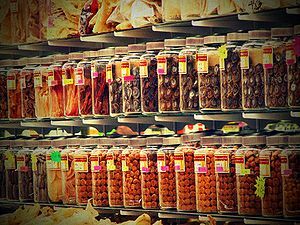 From 1 May 2011, traditional herbal medicinal products must be licensed or prescribed by a registered herbal practitioner. However, the move has caused some criticism as herbal practitioners say it is difficult for most herbal medicines to meet the licensing requirements, due to the large costs of testing. The Alliance for Natural Health (ANH) estimates the cost of obtaining a licence at between £80,000 and £120,000 per herb. They say this will be affordable for single herbal products with big markets but will drive small producers of medicines containing multiple herbs out of business. Thousands of patients who use herbal treatments may lose access to the herbal medicinal products, and medical organisations including the Medicines and Healthcare Products Regulatory Agency (MHRA) have warned that these measures may drive patients to obtain the medicines over the internet at a much greater risk. Although the GM crops and herbal remedies proposals are unrelated, it does seem as if the general consensus in the EU at the moment is that GM crops are harmless, whilst herbal medicinal remedies are a safety concern. Or am I being too cynical?